A while ago, we received the "God Gave Us Love" board book. We have several of the other "God Gave Us ...." books and were excited to read the newest addition to this set of books. 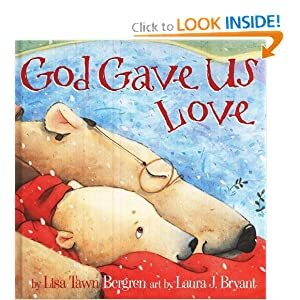 Each book in this series focus on the faith and questions from a little bear cub, and this one in particular is about loving others whom we may find difficult to love. I believe the author does a great job relating this story to little children. The pictures are captivating and the story itself very engaging. My 2 year old daughter really enjoyed this book as I read it to her. I loved this book and look forward to reading it to my daughter and son for years to come!